P.G. 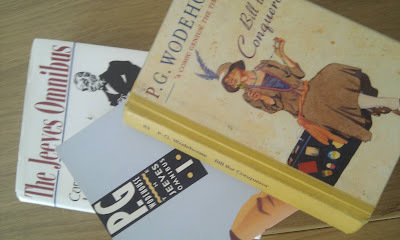 Wodehouse and, in particular, his "Jeeves" series, has had me in stitches. Literally. I have the whole 'shoulders-hopping-up-and-down' thing going on. And there are more one-liners than a stand-up comedian can shake a (diamond-tipped) walking stick at. P.S. If cookery is more your thing, I've just posted some more recipes to my new blog - my little red file ! Why Diane, you are a real sweetie! Thanks for the mention! I haven't read Jeeves, but I do have one on my Nook to read. Someday. Maybe it can be in my next 100 books? !